B received a set of two adorable pajamas from a great-aunt a few weeks ago. They are made to look like the costumes from Woody and Buzz Lightyear in the Toy Story movies. 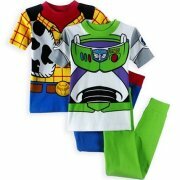 The shirts have the emblem that makes it look just like you are Woody or Buzz. I thought this was pretty nifty, and B could wear them and pretend to be a cowboy or a space guy. He wants to wear them. Really, he does. But he is terrified. He still thinks the movies are a little bit scary, and he believes that wearing the costume/pajamas will cause the events of the movie to happen to him. If he dresses like Woody and Buzz, the bad guys will show up and haul him off somewhere. The very idea of putting on the pajamas puts him in anticipatory tears. Don’t get me wrong—we are not forcing these pajamas on him. We talk about them every now and then, and ask if he wants to wear them. He always says yes. Then, as bedtime nears, tears explode. It takes a few minutes, but eventually he confesses he just doesn’t want to wear the Toy Story jammies. We reassure him that he does not have to wear them if he doesn’t want to, and remind him that there is nothing to be afraid of, that nothing bad will happen just because you wear a costume. In my spiritual life, I find myself always trying to soften the jagged edges of reality, to enter the space between “real” and “pretend.” As Walter Brueggemann reminds us, biblical, prophetic faith is the product of a vibrant imagination. We must visualize the world to be as God’s prophets describe it, imagine ourselves into building that world, connect creatively to the stories and people of the scriptures. It is in that imaginative space that God meets us, to heal and challenge and renew. Dwelling in imaginative space is risky. Like B, we can start to fear that the traumas of the characters will happen to us as well. We might be assaulted, challenged, changed, even crucified. Our world might be turned upside down forever. Putting on the Christian clothes might just make us into one—and the risk of wearing Christ, imagining a new world, pretending our way into it, frightens us. How often in my life of faith have I resisted the new clothes of Christ, bursting into fearful tears and burying the possibility in a drawer? I am not a poet, and never have been. I am just beginning to conceive of myself as a writer. I can communicate a thought or concept with clarity, and occasionally concoct a unique turn of phrase. That’s about it. Today, however, I wish I was a poet, because B has given me an image that a poet could put to good use. He has already developed his parents’ love of words, and his vocabulary is especially broad for a child his age—but sometimes his desire to use a new word exceeds his understanding of it. It leads to some amusing malapropisms, but also some delightful imagery and new perspectives on the world. I asked him what he meant by “nibbling out of bed,” and he tried to demonstrate with a kind of creeping, crawling movement across the floor. When I gently tried to explain that nibbling was a word that usually describes a way of eating rather than a way of moving, he remained insistent that he nibbled out of bed this morning. But I’m not a poet. Perhaps B will be someday, and I’ll save these words to give back to him to explore again. Or set them loose in the world now, for another poet to take up and carry around. 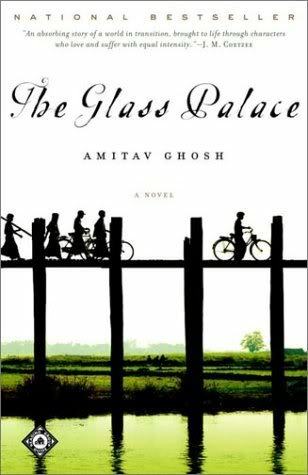 The Glass Palace, by Amitav Ghosh, Random House, 2000, 486 pp. This novel had everything a good epic needs—fascinating characters, intertwined families followed across generations, travel across nations and regions, fortunes made and lost, war and the tragedy of war, love and passion, soldiers and civilians, rich and poor, politics, history and great storytelling. I enjoyed every minute of it. The novel begins in 1885 in Burma, where we meet two orphaned children—Rajkumar, who is poor and alone and making his way in the world, and Dolly, who is an adopted by the queen of Burma to be a servant. The action begins when the British invade Burma and send the Royal Family into exile in India. Rajkumar vows to find Dolly, and 20 years later he does. They marry, and their extended circle of friends and family form the main characters of the novel. The story itself takes place in what was then Malaya, Burma and India, and now comprises India, Malaysia, Bangladesh, Myanmar and even Thailand. The characters find themselves a part of history, from the British conquests and the teak trade, to the rubber plantations and indenture/slavery of Indian peasants, to the Indian Independence movement and the Japanese invasion in the Second World War. I know very little about the history of southeast Asia, so I was fascinated to learn about this history while I was reading the novel. Ghosh’s characters were particularly interesting and unique, because all of the main characters had a tangled, unusual history of racial, ethnic and national identity. Rajkumar is Indian, but lived primarily in Burma. Dolly was Burmese, but the exile took her to India. Saya John, a mentor/parent to Rajkumar, is ethnically Chinese, but raised in a Catholic orphanage with a European education. In some circumstances, it is only their separation from their home country that allows them to overcome the prejudices of colonialism and caste to make their successful way in the world. The novel itself was so rich, so dense, so full and complete that it is difficult to write about it in great detail. All I can say is, read it! 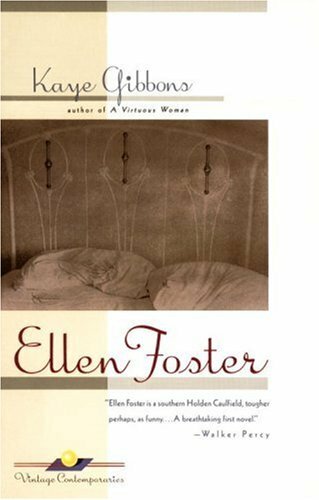 Ellen Foster, by Kaye Gibbons, Algonquin Books, 1987. Kaye Gibbons has crafted an amazing voice in this novel. The story is told by Ellen who, in spite of being only 11, refers to herself as “old Ellen.” She is the victim of neglect and abuse, but she never even hints at self-pity. Her voice is so compelling because it is unwavering in its frankness and determination. As the story unfolds, she first talks about caring for her dying mother under a blanket of rage and demands and violence from her alcoholic father. After her mother’s death, she stays with her father until it becomes too dangerous. She stays with a caring teacher, the grandmother who blames her for her mother’s death, an impoverished African-American family, her aunt and finally a loving foster home. Through it all, we adult readers perceive a child who is victimized, tossed about, adrift and abandoned. Ellen’s voice, however, tells a different story—it is a story of a girl with plans, who takes care of her own needs and learns to be satisfied and happy with the simple things. Her dream is for a loving family, not anything of material significance—except maybe a microscope. Her main example for the kind of love she yearns for is from Starletta, an African-American girl that she befriends in spite of Jim Crow color line obstacles. Starletta’s family takes her in at her most desperate, and Ellen still feels fearful and dirty for having been in their home. One of the most beautiful aspects of the novel is Ellen’s transformation in this regard, as she yearns to make it up to Starletta by inviting her into her new home, to share her food and her bed, without prejudice. Ellen’s voice in this book is so compelling, and her determination wins the day. A great story, beautifully written. I love the United Church of Christ! This morning, they revealed the latest ad inviting people into our wondrous and wild and welcoming tribe. The message is entitled, “The Language of God,” and it moved me to tears the first time I saw it. Take a minute to watch. The images speak the language of God to me. God speaks when we love each other. God speaks when suffering ones are comforted. God speaks when outsiders are included. God speaks when lonely ones in lonely places are acknowledged. God speaks when young and old gather together. God speaks in sacraments. God speaks in marches for justice. God speaks in a lovers’ kiss. God speaks in pulpits and pews. God speaks in the wonders of creation. God speaks in the faces of children. God speaks when boundaries of race and class and geography are overcome. God speaks in music, in silence, in words. God speaks through broken human beings like us. My church is engaged in all those things. Both my local congregation and the United Church of Christ we belong to go chasing after God, worshiping God and sharing God by loving God’s people. And when you start loving God’s people, God starts speaking. That’s why I love the church. We are not perfect, but we try to practice loving God’s people, and when we do God’s voice is heard loud and clear. No matter who you are or where you are on life’s journey, you’re welcome here. Palm Sunday this year was a microcosm of the ups and downs of being a preacher’s kid. It was a big Sunday at our church, with a special event that more than doubled our normal attendance. J does not come to church, so B usually hangs with me and runs around the fellowship hall before worship, then sits with the nursery worker (Ms. F) and her family until after the children’s sermon, when all the children head to the nursery or Sunday school. However, Palm Sunday begins with a Blessing of the Palms with our neighboring churches. 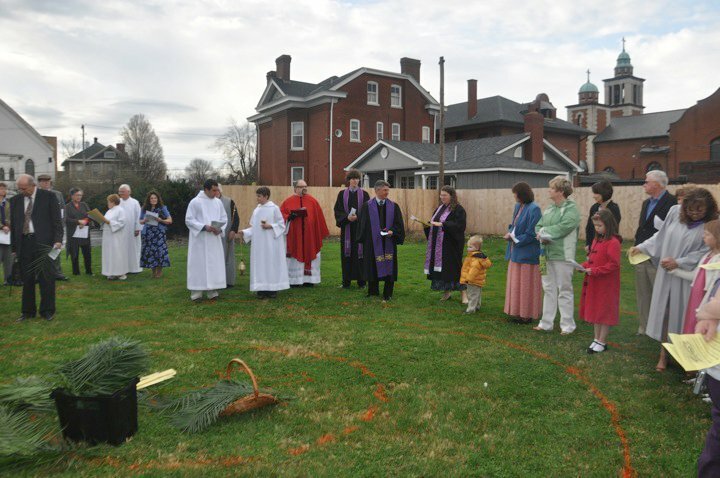 We all gather in the back yard of the church, lay the palms in the grass, bless them, sing, and process back to our own churches for worship. I figured it would be nice for B to stay with me during this part. Everyone stands in a circle, so he could just stand with me in the clergy clump. He got to hold my hand and lead the procession into the church, singing “All Glory, Laud and Honor.” I had been practicing the song with him all week, so he knew the first verse and chorus for us to sing together. And what kid doesn’t love waving a palm branch in the air, leading the parade? High times. Once we arrived in the sanctuary, I deposited him in his normal spot with Ms. F and her family, and everything flowed smoothly. He came up with the other kids for the children’s sermon, and departed to play with his friends in the nursery. After church, I always have a hard time getting back to see him, so he sits at fellowship hour with Ms. F. She makes sure he gets cookies and lemonade, and I try to work my way through the crowd before he’s finished with them. But this was a big Sunday. A really, really big Sunday. After church was a full luncheon and program, and crowds of people trying to talk with me. I breezed by to check on B at one point, and he looked overwhelmed by the crowds. “I want you to sit with me,” he said. “I’m sorry, B, I can’t right now—I still need to talk to some people. You enjoy your lunch.” He looked disappointed, but the fruit and cookies on his lunch plate quickly restored his spirits. The luncheon wore on, and I was helping to lead the program. I managed to get to the food table and load a plate, but there was no chance of eating. I weaved my way to the table with B and Ms. F’s family and set the plate down. B said, “Mommy, I want you to sit with me. I want to eat all together.” I noticed his lunch was mostly untouched. “I’m sorry, B, but I can’t right now—I’ll come back and sit with you when I’m done leading up front, and we can sit and eat together.” He looked sad. Then it was time to hand out gifts for the special occasion, so I was walking from table to table handing out gift bibles. I got to B’s table with Ms. F and family. “Mommy!” He was so excited to see me. I smiled back, but I was talking into a live mike and I had to keep moving. When I was two tables away, I turned to see him standing on his chair, looking over the heads of the crowd directly at me: “Mommy! I want you to come sit with me!” The look on his face was forlorn. “I’m sorry, B. I’m almost done, I promise. My plate is with you, and I’ll come sit and eat with you as soon as I’m done.” His face fell, then wrinkled, then pulled tight into a cry. Mine almost did too. I watched him take a deep breath and pull himself together to avoid a meltdown in public. He sat down quietly and waited. I felt awful. No one else seemed to even notice this moment, or the tension I was feeling as mom and minister. Finally, I said a prayer to send the crowds out, and tried to work my way across the room to where my son and my lunch awaited. It felt like people were swarming around me—everyone wanted to say something, to congratulate me on the successful event, to tell me a story, ask for a prayer or just have my attention. I finally made it to where he was sitting. Ms. F had carefully preserved my plate and his, even as the volunteers were busily clearing the tables. I greeted him, but his response was half-hearted. I tried to sit down, but three more people lined up to talk to me. Ms. F and her family left, and two more people came to talk to me. B got up and stood next to me at the table, and I picked him up and let him interrupt the adult conversation, once again promising to sit down and eat in just a minute. Finally, there was a break in the flow and the hall began to empty. I sat down in my chair and put B in his, only to discover that our food was gone. We had been standing there the whole time, but someone had come along and cleaned off the table—including our food. Poor B just lost it. You just don’t break a promise to a three-year-old. Especially one who has been so patient and so good while for the last two-and-a-half hours his mother paid attention to everyone in the world but him. I felt awful. And exhausted. And hungry. And embarrassed that my three-year-old was bawling in my arms, but proud of him for standing up for his needs the only way he knew how. In one short Sunday, B had journeyed from the head of the parade to the back of the line, from the center of attention to the only one who couldn’t get my attention. This scenario gets repeated week in and week out. Everyone wants to greet him and talk to him. They bring him gifts and talk about how cute and smart and beautiful he is. He is everyone’s darling. But they aren’t his darling. I am. He loves the attention and he has extra grandmas everywhere—but the only person he really cares about is me. I’m the person that meets his needs and calm him down. I’m the one he wants to share his lunch with, the one he wants to show his new truck to, the one he wants to hold him. And on Sunday mornings, I’m the only one he can’t have. And it must seem from his perspective that he’s the only one who can’t have me. When he is not being darling, when he just needs his mama like any other three-year-old, he can’t have me—because those same people are keeping mama busy listening to their medical concerns and church business and questions about the Mother-Daughter banquet. They are needy children too. I feel every week the stress and strain of being both minister and mom, attending to both the needs of my son and my church members. But he feels it too—the stress and strain of being the preacher’s kid, who is simultaneously the head of the parade and the last in line, but never able to be just an ordinary part of the crowd, a kid enjoying worship and a church potluck with his mama. After some hugs and rocking, we went to the kitchen together, and because I am the preacher they opened the foil wrappings and put-away casseroles for us. We managed to cobble together enough leftovers to resemble a lunch. As much as I wanted to just go home and kick off my shoes, we sat together in the church fellowship hall at the same table where B had waited so long with Ms. F and her family, and quietly ate our food while the volunteers wiped tables and mopped floors around us. It was the best this minister mom could do that day. All New People, by Anne Lamott, North Point Press, 1989. Anne Lamott has done it to me again. The book may be 20 years old, written about a childhood 50 years ago, but the feelings and experiences of vulnerability, heartache and broken human relationships are as fresh as ever. All New People is the story of Nanny Goodman growing up in Marin County in the 1960s, with off-kilter parents and a clash between the tennis club perfection (and imperfection) and the leftist/hippie counterculture. We read Nanny’s perspective on the complicated and changing adult relationships with her parents, relatives and friends as she navigates her own attempts at relationships and growing selfhood. This book spoke to me on a deep level. I was in tears before I even reached the first chapter. The prologue takes place in a hypnotist’s office, where grown-up Nanny has gone to find healing for her “anxiety, melancholia, fears of loss, rejection, death, humiliation, suicide, madness…” (6). The hypnotist asks her to scroll back through her life’s most painful memories, one by one, as though viewing each as a snapshot and analyzing the poses. She goes back to the very beginning, one of her earliest memories of pain, and then the hypnotist instructs her to help her child-self through each situation, offering words of comfort, healing, humor and forgiveness. Nanny’s walk through her life’s painful moments became my walk through mine. There are painful memories in my life that I cling to fiercely, angrily. I have protected my anger in those moments like it is the only thing guarding my child-self from complete collapse. Probably, it once was. But Nanny’s walk made me realize that there is another way to protect the young girl in my memories. I don’t need to be angry and defensive on her behalf—perhaps I can just give her what she needed then, to help her out with comfort, healing, humor and forgiveness. Since reading that prologue, I have already begun a process of reviewing my personal painful snapshots, and stepping in to change the picture. I have been carrying these hurts for a long, long time. I already feel like the stone has been rolled away. The age-old anger is starting to abate, and the forgiveness creeping in. It has been a long time coming. This is a great description of my experiences of holy encounters—but even more, it is what happened to me in reading the prologue of this book. The veil opened for me a tiny bit, and God shone through. Once again, art is healing. Thank you, Anne Lamott.